If you have ever eaten at a restaurant and wondered, "what is mahi mahi", then you are definitely not alone. There are many restaurant goers who have no idea what this delicious fish is about or where it comes from. Mahi mahi is a fantastic tasting exotic fish that is on the safe list for sustainable fishing, which means that you can eat it to your heart's desire without having to worry about overfishing as with many other types of seafood today. Mahi mahi is known by many other names such as dolphin fish, dorado, rakingo, maverikos or lampuka. The name mahi mahi, used most frequently in American restaurants, is its Hawaiian name that means "strong". The fish was named mahi mahi or "strong strong" because it has an incredible fighting ability and strength. Because of this strength it is a favorite fish among sportsmen who value it as a difficult, but worthy catch. Mahi mahi is a surface fish that is found in off shore environments of tropical and subtropical areas of the world such as the Caribbean, South Pacific and Southeast Asia. The fish have an average life expectancy of about three to four years, which means that they will reach their full size within the first year of life. They are carnivorous fish that feast on a diet of smaller fish, squid and a variety of crustaceans. However, because they are carnivores doesn't make them immune from the jaws of other carnivorous fish such as sharks. The mahi mahi is a stunning fish that comes in a rainbow of colors such as gold, bright blues and greens. The males have large foreheads and the females are recognized by a smaller head. Both males and females have flattened, square heads. Because of their exceptional flavor, beautiful colors and the fact that their population is sustainable, mahi mahi are sought after by recreational and commercial fishermen alike. When looking for the fish, sportsmen and commercial fishers look in tropical waters in places that have floating debris, such as floating palm trees, wood or weed lines around buoys. Commercially the United States and Caribbean countries consume the most mahi mahi. While fishing for this whitefish is done by a classic method, in other areas of the world, such as French Polynesia, the fishermen use harpoons while in a specially designed boat called the poti marara. It is a powerful V-shaped vessel that is driven with a stick so the fisherman can harpoon the fish with the other hand. This whitefish is an incredible tasting fish with a firm flesh and sweet flavor. 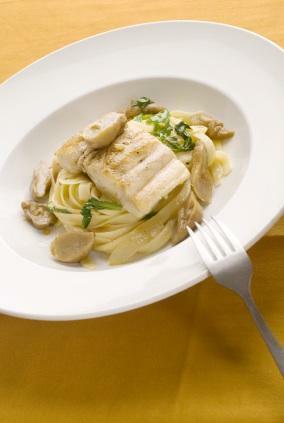 It is popular in the restaurant world because one fish yields many pounds of meat and it means that there is less waste. As an ocean fish, mahi mahi is best freshly caught, although it is often sold frozen. It is excellent in any recipe that calls for a firm white fish. It stands up well to bold flavors, such as in a ceviche or with a bright highly flavored marinade. Mahi mahi is excellent in fish tacos, or with other bold flavors, such as mint, dill, rosemary, garlic or saffron. It works beautifully on the grill, or sauteed with olive oil. Its flesh is firm enough to stand up to baking, or slowly roasting. Another excellent way to cook mahi mahi is by placing the fish in foil and wrapping it up with onions, garlic, fennel, tomatoes and fresh herbs. The aroma when you open the little foil parcels is incredible so your guests will be blown away. If you have a recipe that calls for other white fish or for swordfish, mahi mahi can fill in easily for any other firm-fleshed fish. Now that you can answer the question, "what is mahi mahi," why not put some on your dinner table?